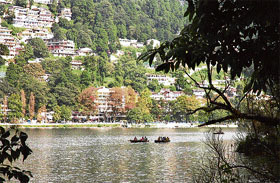 PLACID CHARM: The hill resort of Nainital and the surrounding area have a number of lakes. For most the fun begins with a trip to the pristine hill station of Nainital and ends with boat rides on the turquoise waters of the placid Naini Jheel along the Mall. The more adventurous can go strip-sailing on a yatch that can be hired from the Boat Club along with a skilled yachtsman or can obtain a permit for angling and spend a lazy afternoon trying to capture the famous trout of the region. Though Nainital maybe the preferred destination for holidaymakers, many discerning tourists are skipping the crowded hill station to discover its scenic surroundings. 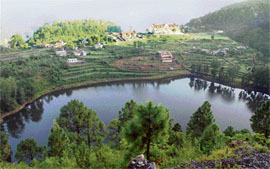 The hill resort is surrounded by a number of lakes. Little wonder than that the British called this 25-km radius around Nainital the lake district of Kumaon. It has the most picturesque freshwater lakes in the Himalayan region. Legend has it that these lakes were formed when three thirsty sages dug a deep well in what is now Nainital. From there sprang not one but several fresh water lakes. Nainital is 275 km from Delhi with a driving time of around 8 hours. The nearest railhead is Kathgodam, 35 km away. Buses and taxis are available for Nainital. The nearest airport is at Pantnagar, 71 km away. The best way to visit the nearby lakes is by a bus or taxi that has fixed rates. The temperature is moderate in summers but it can get chilly in the evening. Carry light woollens. It gets very cold between November and February. Carry heavy woollens. For rains between July and September, carry raincoats, umbrellas and woollens. There are hotels to suit every pocket. Just 12 km from Nainital is Khurpatal beside the Kaladungi Road, made famous by Jim Corbett. Encircled by lush green terraced fields, this unspoiled lake resort is almost picture postcard in perfection. At an altitude of 5,500 ft above sea level, this lake is an angler’s paradise as it provides a variety of fish like mahseer and carp. If you are not keen on fishing, you could take a trek into the thickly wooded surroundings. It would be best to stick to the 5-km bridle path developed by the tourism department. And it would be best to heed the advice of the department to trek on this path as it is not uncommon to sight a hyena or even a panther lurking in some corner. You could walk to the next lake that is just 6 km away at Bhimtal. This hamlet on the lakeside is a source of pleasure for those who enjoy the pristine bliss of nature. The lake that has an island in the centre is larger than the Naini lake. There are many ancient temples dotting the numerous hilly trails. One of these leads to the Bhimeshwar temple, which is said to have been built by Bhima. Bhimtal was a part of the ancient Silk Route. If you were to visit the resort in springtime, you would find the surrounding woods peppered with dog roses and wild raspberry. The picturesque resort of Sattal is around 20 km from Nainital. It had seven lakes but now there are just five as two have dried up. Interestingly, four of the five lakes are named after the main characters of the Ramayana — Rama, Lakshmana, Sita and Hanumana — and the fifth lake is named after Garuda. The sixth and the seventh were named after the mythological king Nal and his wife Damyanti. There is a whiff of freshness all around and Sattal must be one of the most stunning hamlets of this lake region. Surrounded by dense wooded hills laden with oak, pine and fir trees, it is home to over 10,000 species of butterflies. It is also an important stopover for migratory birds. A boat ride in one of these lakes can truly be a mesmerising experience. Naukuchiyatal is 24 km from Nainital. It is the deepest lake of the region and has nine corners which explains the name. This, too, is a lush resort that has a natural growth of medicinal plants. The forests here are wooded primarily with oak. Apart from exhilarating nature walks, the hill resort even offers paragliding. Curiously, it has never attracted many tourists which in a way is a blessing as that has helped retain its charm and keep the lake water sparklingly clear. Legend has it that if you can view all the nine corners at one time, you are assured a place in heaven. In modern times, all you have to do is take a helicopter ride over the lake to view the nine corners! Indeed, there’s seldom a more bewitching sight than nature unveiling its pristine beauty. And when the sight happens to be as splendorous as the lake district of Kumaon, you just stand transfixed. It is not for nothing that the British described the lake district of the Kumaon region as a gem in perfect setting where graceful willows encircle the lakes.